Australia has over 140 different snake species and although around 100 are venomous only 12 can inflict a bite that may kill you. Below we describe 3 venomous snakes and 1 non venomous snake commonly found in southern NSW. Tiger Snakes (Notechis scutatus) are possibly the hardest snake to identify. They can have stripes, as their name indicates – but many do not. They can be brown, caramel, grey, black, golden … or even yellowy-olive. Similarly, they can be small – even as adults – or extremely large, but the average size is 1m. Tiger snakes are primarily frog eaters, but can do a wonderful job reducing mouse and rat populations and will even eat young rabbits. They are almost always found in close proximity to freshwater of some kind and give birth to live young, making them ideally suited for life in the cooler climates of southern Australia which is frequently too cold and unpredictable for the reliable incubation of eggs. Red-Bellied Black Snakes (Pseudechis porphyriacus) are glossy, jet black with bright red or pink ventral colouring extending slightly up the lower flanks, have gently rounded heads and can reach 2m in length. This species is found close to dams, swamps and creeks, and they eat frogs, eels, fish, lizards and small snakes. The Red-Bellied Black Snake is the only member of the black snake family which gives birth to live young: an adaptation which has allowed this species to live in the much cooler southern climates than its close relatives. Eastern Browns (Pseudonaja textilis) are almost always a variation of brown, from greyish to bright caramel, although some near-black individuals have been observed. They have small, delicate heads, brown eyes and a pale creamy underside with occasional brown speckles and usually grow to around 1m. Thriving in agricultural areas, Eastern Browns love to eat mice and rats, and are egg-layers which makes them one of the most southerly egg-laying snakes in Australia. 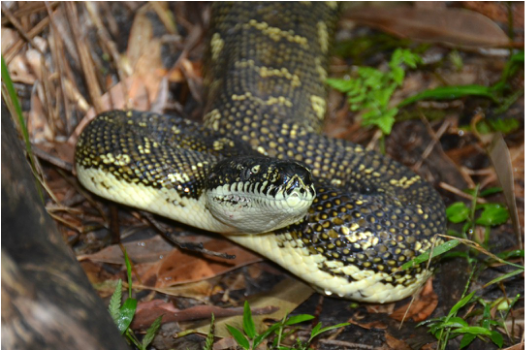 A subspecies of the Carpet Python (Morelia spilota) is popularly known as the Diamond Python (Morelia spilota spilota). It is a medium-to-large snake, the average adult size is usually about 2m and they are found in coastal areas and adjacent ranges of south-eastern Australia. They are the most southerly occurring python in the world and are found at higher altitudes than any other species of Australian python. They are quite variable in colour and pattern, typically being predominantly dark olive to black in colour with most dorsal scales having a yellow (or cream) spot in the centre (hence 'spilota', meaning spotted). Along the body and tail are numerous clusters of yellow or cream scales that form 'rosettes' that look a bit like diamonds (hence their common name). The underside is white, cream or even yellowish in colour, although it is often spotted with black. The Diamond Python are egg laying snakes, and live in a variety of habitats, including heaths, woodland, forest and urban areas. They also are known to occupy the roof space of suburban homes, living on mice and rats.